Notice appeared in the New York Daily Times 12 May 1853 to the effect that Bradbury's Piano and Melodeon Warerooms had moved to larger quarters at No. 423 Broadway. This was signed E. G. Bradbury - i.e., Edward G. Bradbury, a brother to William Batchelder Bradbury (1816- 1868), a music editor, composer and conductor who lent his name to the Bradbury piano. In 1858 Henry Newton withdrew from the firm, which was renamed Lighte & Bradburys. By 1864 both Bradburys had split from Lighte, and William B. Bradbury formed his own firm with "mastercraftsman Freeborn G. Smith" (quoting Nancy Groce, Musical Instrument Makers of New York, Pendragon Press, 1991). When Bradbury died in 1868, Freeborn G. Smith took over the William Bradbury Piano Co. and continued to produce the Bradbury pianos. The Antique Piano Shop says that the Bradbury Piano Co. stayed in business until about 1950. This ad for F. C. Lighte & Co. appeared in Gopsill's Newark City Directory. It dates from 1867, when F. C. Lighte & Co. consisted of F. C. Lighte and Louis Ernst at 421 Broome St. This ad for the Bradbury Piano dates from 1869. The company was F. G. Smith & Co., "successors to Wm. B. Bradbury," and they were located at 427 Broome St.
Freeborn Garrison Smith (1828-1911) was described as follows in his obituary notice in the New York Times 19 Oct. 1911: "Mr. Smith was born eighty-three years ago in a log cabin near Baltimore, Md. When a young man he came to this city and worked as a piano maker. He became associated in business with William B. Bradbury, whose interests he subsequently purchased. Since 1867 Mr. Smith had been the manufacturer of the Bradbury piano, his factories being at Fulton and Adelphi Streets, Brooklyn, and near Leominster, Mass. Several years ago he retired from active business, being succeeded by his son, Freeborn G. Smith, Jr. For many years Mr. Smith was prominent as a Prohibitionist and in church work in Brooklyn. He was several times nominated for office by the Prohibitionists." Freeborn G. Smith had traveled from Maryland to Massachusetts (where he worked for the Chickering Piano Co.) before settling in New York. The following account is given in Pianos and Their Makers, by Alfred Dolge (1911), "A peculiar character, with many strong traits, we find in Freeborn Garrettson Smith. Learning his trade in Baltimore, he worked for some time in Chickering's factory. In 1861 he became superintendent for William B. Bradbury. Bradbury was a musician by profession, who had bought an interest in the firm of Lighte & Newton (established in 1848), and when he dissolved partnership with Lighte, he found in Smith a good manager for his factory. After Bradbury's death in 1867 Smith bought the business, continuing the name of Bradbury. Immediately the commercial instincts of Smith came to the surface, and he developed greater talents as a distributor of pianos than as a maker. Original in his methods, he published for a long time a testimonial of the well-known preacher, T. DeWitt Talmage, in which the latter declared that if the angels are using musical instruments in heaven, the Bradbury piano would surely be there, because of its sweet tone. Smith was among the first who opened warerooms in leading cities, selling his product direct to the public rather than through dealers. He is counted among the wealthiest of those men in the piano trade who have accumulated their fortunes by thrift, energy and exceptional business ability." Freeborn Smith not only manufactured the Bradbury piano but also the Webster piano. The Piano and Organ Workers' Official Journal, Dec. 1904 and Dec. 1905, told of Smith's moving the Webster piano operation from his Brooklyn factory to a factory in Leominster, Mass., where previously they had made only the cases. The Webster Piano Co. shared offices and showrooms with the Bradbury Piano Co. at 142 5th Ave. from 1899 until around 1915, when both moved to 333 5th Ave. By 1918 they have both moved again to 450 5th Ave. By the mid-1920s the Bradbury and Webster pianos were being manufactured by W. P. Haines & Co. at a Bronx location, 113 E. 138th St. This ad from the 1914 Orange, New Jersey, city directory mentions the Bradbury and Webster Pianos ("F. G. Smith, Manufacturer") available in a showroom in Newark, NJ. Following Freeborn Smith's death in 1911, he was succeeded by his son, Freeborn G. Smith, Jr. (1857-1940), and his grandson, Frank Garrettson Smith (1886-1939). The W. P. Haines piano company is described as follows at the Antique Piano Shop, "The W. P. Haines Piano Company (not to be confused with 'Haines Brothers') was established in 1898 by William P. Haines. The firm is first listed at 138th Street & Walton Avenue, New York City. The firm was incorporated in 1910 by T. Linton Floyd-Jones, the grandson of W. P. Haines. The W. P. Haines Piano Company built a full line of upright pianos, baby grand pianos and player pianos, and their instruments were known for being of very good quality, and the firm was very successful. The W. P. Haines factory was capable of high volume manufacturing, and they actually manufactured pianos to the specifications of several other firms during the early 20th Century. In addition to pianos sold under the 'W. P. Haines' brand name, the firm built instruments for The Bradbury Piano Company and the Webster Piano Company. W. P. Haines also built a line of very high quality pianos for Robert Loud, a prominent retailer and piano dealer in Buffalo, New York during the �teens and �twenties. After the Great Depression, the firm was absorbed into the large Winter Piano Company of New York. 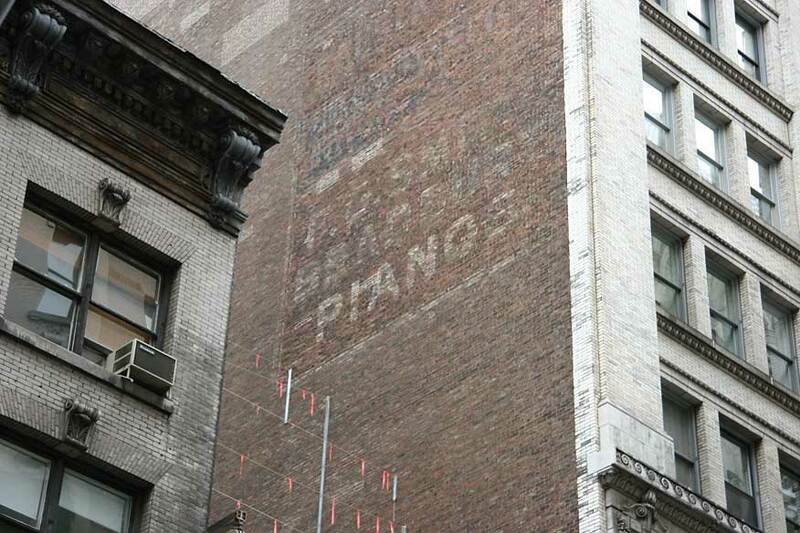 Winter continued building pianos under the W. P. Haines brand name until about 1950." William Pitt Haines (1853-1927) was a brother to Napoleon John Haines and Francis W. Haines, the founders of Haines Bros., and he was listed as a member of Haines Bros. in New York city directories from 1880 to 1899. His great-nephew, Thomas Linton Floyd-Jones (1875-1937) became president of W. P. Haines Co. in the 1920s. Thomas L. Floyd-Jones' brief death notice in the New York Times, 26 Jan. 1937, read in part, "Mr. Floyd-Jones was born in New York, son of the late Thomas and Julia Floyd-Jones. He had served for many years as president of W. P. Haines & Co. and the Bradbury Piano Company." Thomas Floyd-Jones (1841-1919), the father of Thomas L. Floyd-Jones, was also a member of W. P. Haines. His death notice in the Times, 12 May 1919, read, "Thomas Floyd-Jones, member of an old Long Island family and author of "Backward Glances," depicting New York life half a century ago, died on Friday at the home of his son-in-law, Alfred B. Sterges, in Nutley, N. J. He was the son of Elbert and Emily Glenworth Floyd-Jones and a descendant of Richard Nicolls, Governor of New York in 1664." In April 1924 Thomas L. Floyd-Jones wrote a letter on W. P. Haines & Co. stationary giving his son, Thomas Linton Floyd-Jones, Jr., permission to travel abroad. The letterhead contains the information "Controlling F. G. Smith, Inc. Bradbury Pianos. Established 1854." The address of W. P. Haines & Co. at this time (office and factory) was 138th Street and Walton Ave. (Mott Haven area of the Bronx). This was their address approximately 1915 to 1927. Earlier W. P. Haines were located on 125th St. (1900 to 1908), Westchester Ave. (1909 to 1911), and 129th St. (1910 to 1915). A short Wikipedia article lists some of William B. Bradbury's publications and describes him primarily as the composer of hymns. A biographical sketch of Bradbury is included in the finding aid for the William B. Bradbury Collection, Music Division, Library of Congress, Washington, D.C.